Vacation time again, and this time for real. We didn’t have ideas for anything super huge and exciting to do, but we figured we’d go to Boston to visit J’s sister, and then make our way to the Adirondacks since we had to cancel our trip there in June. So that was the plan of attack, but it turns out his sister was going to be in Berlin. Jealous! I want to be in Berlin! We stayed at her place anyway, took care of her cats (one giant, one tiny), and played tourist for a few days. Our first day, we bought tickets for a whale watch and a visit to the New England Aquarium. The day was a little chilly for a speedy boat ride, and we were warned that the seas were pretty choppy. We got about a half hour into the ride, out of Boston Harbor, and the captain decided it was too rough and they were going to have to cancel the trip. 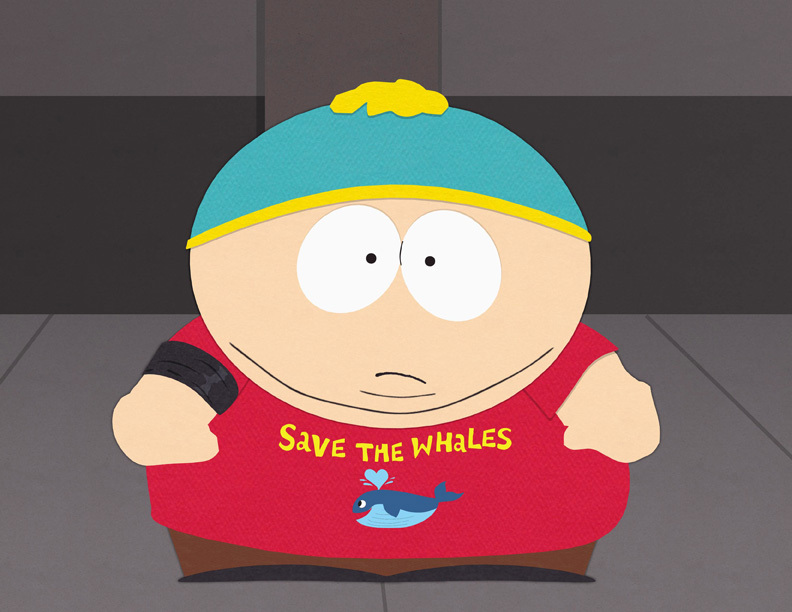 *sadface* So we turned around and headed back to shore, refunds for all, no whales for anyone. The Aquarium was nice though, with a big penguin exhibit in the center, and lots of tanks of crazy ocean life. We had no real plans for the evening, and after dinner we headed out to a Buffalo Bills Bar to watch the home opener. Now, I really don’t care at all about football but it was something to do. That specific bar was PACKED though, so we went around the corner to find a place, and stumbled upon The Fours (apparently America’s best sports bar). I wasn’t planning on having a bloody mary, but it presented itself in front of me, as a drink called the Flea Flicker, so I guess I had to! 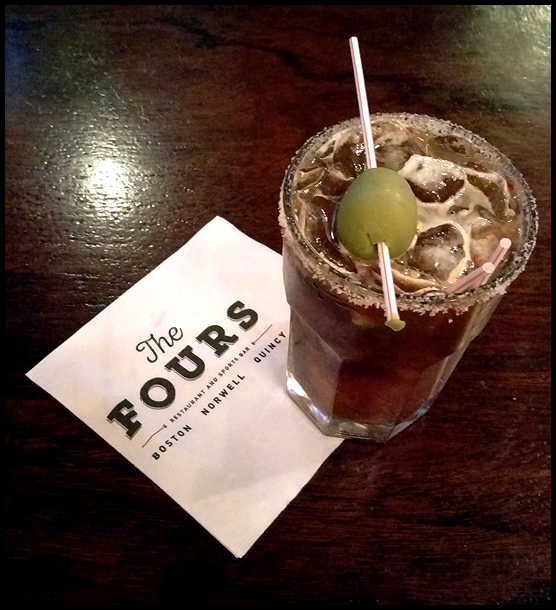 The Flea Flicker – Kettle One Vodka, Housemade Bloody Mary Mix, Guinness Floater, Spicy Salt Rim – $11. The drink had an olive garnish with a lemon and lime plopped in the drink. There was no real spice to it and the tomato flavor was not super evident, somehow. There was a smoky hint to it, and a little sweetness from the Guinness. It wasn’t bad, definitely drinkable, but it wasn’t great. 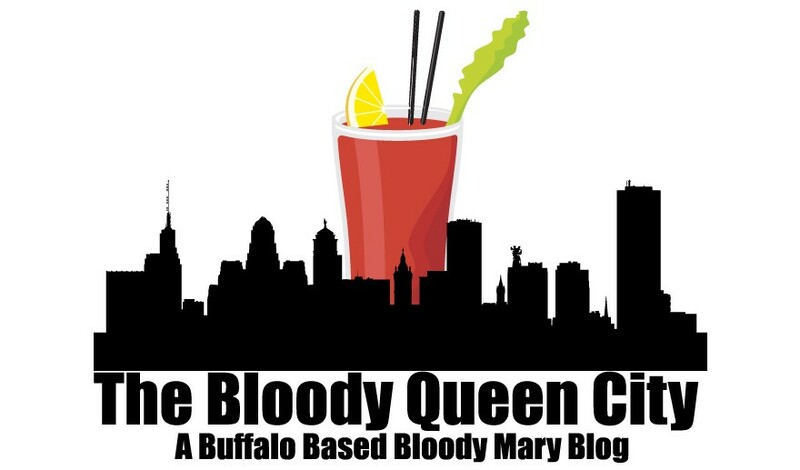 In prepping for the trip, of course I googled the best bloody marys in Boston, but nothing really jumped out as a “must have” drink. I was fine with not trying any during our visit, but in the end I did want to get brunch before leaving for Saranac Lake on Saturday, so I re-googled the list and settled on trying Russell House Tavern in Cambridge, near Harvard. It wasn’t far from where we were staying, easy to get to on the subway so we could get back to the car and hit the road, and had one of the more interesting ones on the list. 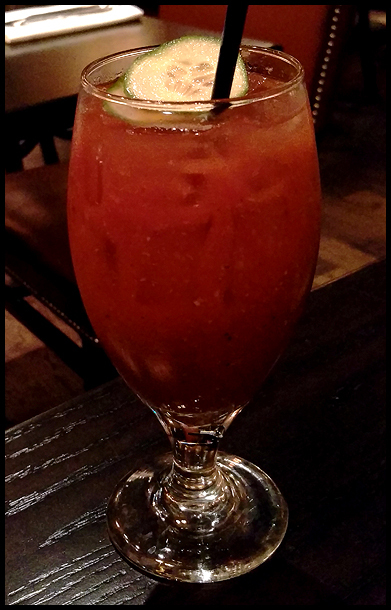 Russell House Tavern featured 4 different drinks on the menu, your standard house bloody, one made with mezcal, one with aquavit, and the one I chose: The Maria Basilico with Basil-Infused Vodka, Meletti Amaro, Cucumber, House Bloody Mary Mix for $11. At first taste the drink was super thick and pulpy, the mix had a lot of visible debris, and was almost chewable, but it became more tolerable after a good stir. It was very spicy, with hints of basil flavor and citrus, with maybe a tad of horseradish. Garnished with cucumbers, which I ignored, it was a decent drink, but it wasn’t as super out of the ordinary as I was expecting. As a whole, from the internet lists of “best of Boston” and the 2 drinks I had, the city can surely step up their game. I was expecting all kinds of crazy offerings featuring lobster, or other seafood, for garnishes. J’s sister had another recommendation for a place, with a “menu” of vodkas, mixes, and garnishes to choose from that perhaps would have been a better choice but it was just too far away for our purposes this time. Guess we’ll have to visit again!